Surprisingly, it was the 3D rejiggering of a PlayStation Network game, not Gran Turismo 5, that made me think "Hey, this 3D display gimmick might not be so bad after all." That game was Housemarque's excellent Super Stardust HD. Playing Gran Turismo 5 At CES... In 3D!!! 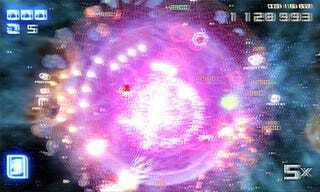 Where Super Stardust HD in 3D succeeded was adding to the dazzling lightshow that a few minutes spent playing the twin stick shooter offers. Sparks seem to fly at the player when ships explode, the volume of space rocks and space ice that much more believable when seen spinning in simulated 3D. While the particle effects impressed as 3D fireworks, the details on the planet and the volume of the force field that protects it showed what can make a 3D presentation improve upon the original 2D look. The details on the planet's surface really popped, as did the wireframe of the planetary force field. There were a few instances where the 3D experience became distracting, particularly at the end of a round when the spaceship flies out of its orbit toward the camera. Otherwise, Super Stardust HD in 3D looks like one of the better options to take advantage of the technology.